Hello, and welcome back. In our last blog, we began exploring some of the common injuries sustained in auto accidents, and the ways that a car accident chiropractic can help patients heal from their injuries. If you would like to read part one, please click here. Some of the injuries discussed include soft and hard tissue injuries to the neck and back like whiplash, spinal misalignment, and muscle sprains. 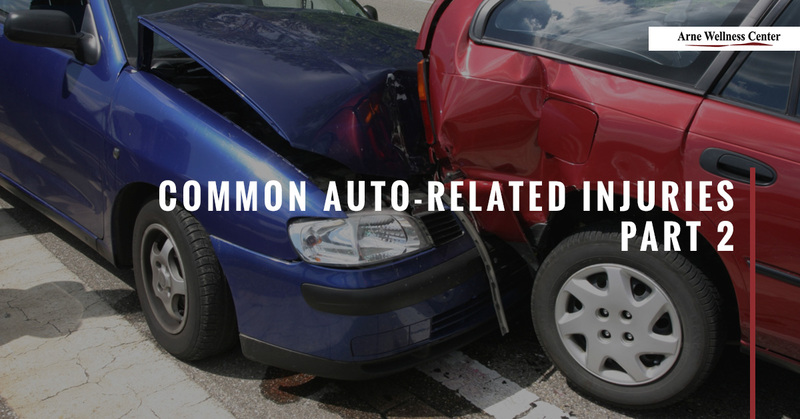 Today, we’ll continue looking at more of the common auto-related injuries, so please continue reading below. Car accidents often cause chest injuries as a result of hitting the steering wheel or dashboard, and can even be caused by the seat belt or airbag deploying. These injuries are quite common because drivers and passengers are positioned behind the hard surfaces of steering wheels and dashboards. Chest injuries usually manifest in the form of muscle strain, bruises or contusions to the sternum and/or ribs, but can also be much more severe involving fractured ribs or internal injuries. Symptoms usually include sharp, shooting pain, trouble breathing, and pain that gets worse with coughing, laughing, or when pressure is applied to the injured area. Muscle strain causes a mild to moderate aching in the chest, shoulders, and sometimes into the neck, which even if it seems unsubstantial, should be examined and treated. Similar to the force that induces whiplash, arms and legs can also be thrown about during an auto collision. Because vehicles typically don’t leave much room for leg movement while in a seated position, a driver’s and passenger’s knees can either be jammed into the dash, the back of a seat, or, in the case of a side collision, may slam hard against the door. Arms can also collide with doors, windows, and even other passengers. The powerful force of a collision, even one at low speeds, can still cause injury to arms, hands, legs, and feet. Symptoms include muscle and joint soreness and stiffness due to inflammation, limited range of motion, bruises, sprains, and in severe cases, broken bones. Even if an injury seems minor, symptoms can take several days to manifest. It’s best to seek chiropractic care immediately. Contacting a car accident chiropractor is a great way to begin treating a chest or extremity injury (unless it’s life-threatening, then dial 911 or go to the ER) because he or she can discuss your symptoms, examine the injury, and request diagnostic studies. Chiropractic care, which includes muscle work, spinal manipulation, and may incorporate other treatments that involve ice, heat, ultrasound to reduce inflammation, acupuncture, and more. Chiropractic care for auto injuries can ease pain, restore movement, and realign the spine. What’s more, your chiropractor can refer you for massage therapy, physical therapy, or other treatments that work in conjunction with chiropractic care to treat and heal auto-related injuries. Suffering an auto-related injury can be a painful and scary experience, but you don’t have to go it alone. If you have been involved in a car accident and would like to meet with our chiropractor to explore treatment options, contact Arne Wellness Center and let us help you recover and heal. Thank you for reading our blog series. Be sure to check back regularly for chiropractic health and wellness news, updates, and advice.